We haven't opened box yet but after shopping around for a central vacuum this was the best price out there. Shipping was fast. Hoping all the pieces are in the boxes. Get an exceptional cleaning experience with this Prolux central vacuum system. 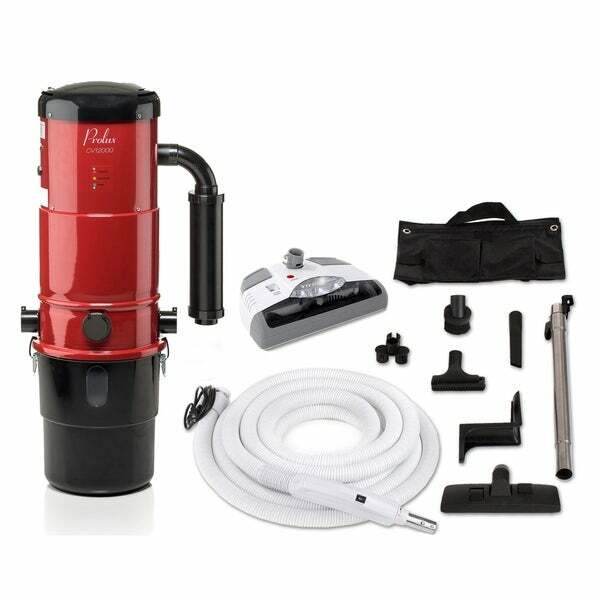 This vacuum is bagless with washable filters and an easy mounting design so you can set up quick and experience the clear air and clean floors this system offers. Prolux Central Vacuum System is one of the best central vacuum systems made! The Prolux Central Vac system cleaners not only improve the value of your home but they also improves the health of your family my removing dirt and allergens from the air in your home by using a Micron and HEPA filtration system. Using the industries best motor (with an amazing 130 CFM of power), this could be the most powerful vacuum in the US! With the extremely powerful Amtek 2 Stage motor, 25 year warranty, and the steel design of the Prolux Central Vacuum System, this high end kit was made to last for many years to come. Central Unit Plus Hose Kit -? ?Comes complete with the central vacuum unit, and 30 foot hose tool and power nozzle hose kit. It is a common practice today for home builders to add the central vacuum piping to the home but that is it.? ?Then all you have to do is attach the central vacuum unit and plug in your power nozzle hose kit.? ?This has both of those so if your home already has the tubing installed this is all you need. ?? Amtek 2 Stage Motor? ?- The Amtek 2 Stage bypass motor produces over an amazing 130 Cubic Feet per Minute of airflow.? ?The Amtek motors are designed to last for decades and are UL certified to be safe.? ?Yes it could be the most powerful vacuum in the US is rated for a home up to 12,000 square feet. Bagless and Washable HEPA Filtration - The Prolux Central Vacuum System does not use bags but has 3 levels of filtration. It has the bagless dirt chamber (clear view window to know when its full), the washable Micron Pre Filter and then the Washable HEPA filter.?? Warranty- 25 YEAR WARRANTY - Not only does it have the industries best motor with 10 year warranty but it also has the industries best steel construction with powder coat scratch resistant paint finish. This allows the vacuum unit to have a 25 year warranty on all steel body parts. 1 Year warranty on hose and head and 2 Year warranty on power head motor. "As a replacement for old Hoover Central Vacuum System, what do the receptacle requirements to plug this system look like?" Hello Russ, unfortunately we do not have any further pictures to upload of this item at this time. I apologize for the inconvenience. Thank you for shopping with us.